Tuesday, December 21st is the winter solstice, the shortest day of the year. Nature's providing us a special gift to get us though the night. This year, the solstice brings us a Lunar Eclipse visible early Tuesday morning. Lunar eclipses occur when the moon passes into the shadow of the Earth. Interestingly, the moon does not completely disappear but rather dims and changes color. It remains illuminated by light that filters though the Earth's atmosphere. It often turns orange but this year some are predicting a blood red moon due to higher amounts of volcanic ash in the atmosphere. One interesting thing to look for is the edge of the shadow on the moon. The shadow has a rounded edge thus demonstrating that the Earth itself is round. The eclipse will be visible across North America and the Twin Cities will be no exception. There are a couple of challenges, 1) It will likely be cloudy, 2) It will be cold and 3) it will be late at night. The current forecast does call for clouds but we'll have to see what actually happens. As far as the cold, a lunar eclipse can be viewed comfortably from inside as long as you can see the moon though a window. There's nothing to be done about the time though. The eclipse begins at 1:41 a.m. CDT on Monday Night/Tuesday morning. It is not a fast event, it takes a while for the shadow to cover the moon. Unlike a solar eclipse, which lasts only a short time, the moon will stay in the Earth's shadow for about an hour. Knowing that it will likely be cloudy, die hard lunatics can watch the eclipse streamed live over the web. One option is to open Google Earth. You can click on the planets icon in the toolbar and switch to "Sky Mode. 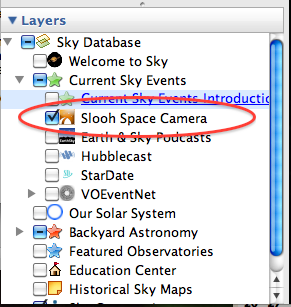 In the layers panel, open the "Sky Database folder", then open the "Current Sky Events" folder and make sure the "Sloop Space Camera" is checked. Probably an easier option is to head over to NASA where they are doing a more traditional web stream of the eclipse.